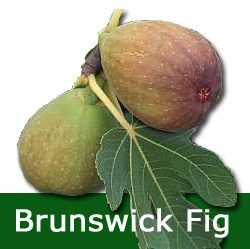 Our Brunswick Fig Tree produces a large pear shaped fruit with Green/yellow skin and just like the Brown Turkey Fig, is very well suited for the UK climate. The rich, sweet flesh is yellow with a red centre and the leaves are hand shaped (we don't think the hands actually do anything like turn the lights off!) All our Fig Trees are at least 2+ years old and are supplied in a pot which makes them very easy to plant and more likely to transplant well and thrive. Supplied in a 5 litre pot. Will require planting or fertilising within a couple of months of purchase due to the small size of pot. If you are confused about figs and are not in the mood to buy one that could be new, problematic, exotic, non-mainstream or whatever your perception maybe, then the Brown Turkey Fig Tree is for you. We are not sure why it is more popular, it just may be that it has been around for longer. We would not sell any fig tree that would not be suitable for UK growing conditions and we add new fig trees to the range from time to time once we have had chance to see their track record. So buy this fig tree if you already have a Brown Turkey Fig tree or want to try something a little different. September 2013: Dear Alan, Yes, the fig tree was delivered in perfect condition! It was very well packed and there was absolutely no damage- I was impressesd! We have now planted it in a large pot, and hopefully will have home grown figs soon...Thank you very much for the excellent service.Best Wishes Varsha Bhatia.